Break the rules in scheduling. Good radio is created with respect to scheduling guidelines formed after many years of research and experience, but to create GREAT radio, you must be willing to occasionally bend or break the rules. The rule: Play only current hits. 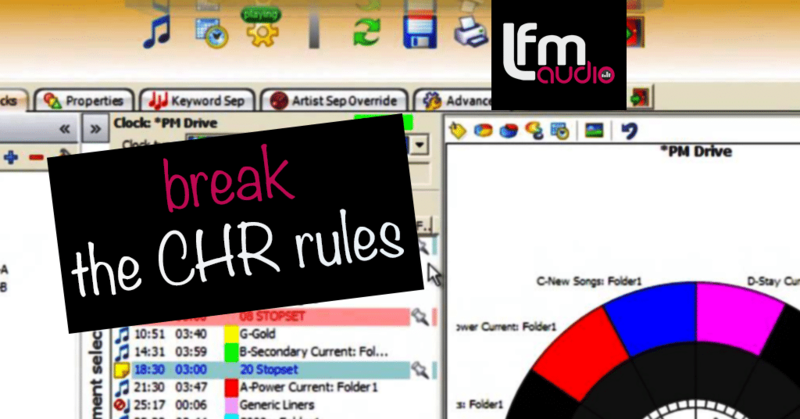 Break it: Often CHR stations will have an ideal image and know what style music works best to support that image, but an unfavourable top 40 mix can change the overall feel of the station. So when your uptempo pop CHR station has a hits playlist heavy on ballads throw the rules out the door and weight the balance by making heavier use of appropriate recurrents, this keeps your playlist in line with your station image. The rule: Never play the same or similar artists without separation rules. Break it: Instead of placing blanket scheduling rules on entire styles or artists be sure to categorise the songs individually. With the fluidity of todays artists and the increasingly common use of featured artists, there can be a huge difference between two songs even if produced by the same person. Think more about what songs sound right next to each other, and your station style, than strict separation scheduling. The rule: All new hits make the playlist. Break it: As tempting as it may be to use your scheduling software to pack the playlist with potential new material as soon as they start to make waves, take a step back and think about scheduling songs strategically. This could mean shelving a song that similar in style to a release by a bigger artist, or opting for a remixed version of a current hit if it suits the image of your station better. An extensive knowledge of music scheduling practises works perfectly with an understanding of when to bend or break the rules. Stations with a solid identity who know how to schedule their playlist to enhance their brand will always find a loyal audience, and that’s great radio!